We are currently accepting online pass requests for the Ocean Bank Center. The passes will be issued on a first come, first served basis. Thank you for your patience. We look forward to serving you. 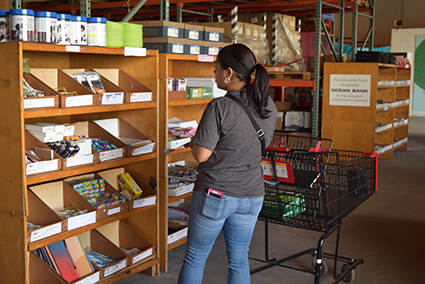 Full-time teachers and current year PTA / PTSA presidents in the Miami-Dade County Public Schools are eligible to visit the Ocean Bank Center for Educational Materials warehouse. Teacher visits are held Wednesdays from 2:00 p.m. to 6:00 p.m., and Saturdays from 8:00 a.m to 12:00 p.m.. Please note we are not open every week and you will receive an email with the date and time of your assigned visit. To obtain a pass to visit the Ocean Bank Center for Educational Materials please complete this form below and include a valid e-mail address (you will receive your pass at the e-mail address you provide). You are entitled to one visit every six months. If you have previously visited, you may request a pass two months prior to your six-month re-visit date. If you visited previously, you must complete an evaluation and visit follow-up form, if you haven't yet done so. PTA & PTSA presidents: You will need to bring a letter on your school's stationary stating you are the president for the current year. The letter should be dated and signed by the principal. Have you visited the Ocean Bank Center before? Did you attend this school year's Idea Expo? Specify your 1st preference for a day of the week you can visit the OBCEM ----- Wednesday, 3 - 6 p.m. Saturday, 8 a.m. - 12 p.m. Specify your 2nd preference ----- Wednesday, 3 - 6 p.m. Saturday, 8 a.m. - 12 p.m.